The Runner can spend click to break any subroutine on Ichi 1.0.
subroutine Trace – If successful, give the Runner 1 tag and do 1 brain damage. My reputation would precede me, if any could speak of it. Ichi is another of the Bioroid ICE that has had its appearance but never really the spotlight. Ichi is often regarded as a great piece of surprise ICE, and like all the three subroutine ICE, considered rather taxing. It is also very well costed for its strength, like all Bioroids. This is, of course, due to their click through drawback. 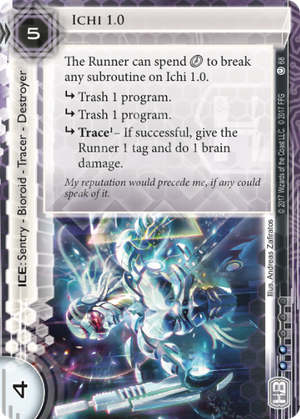 Ichi’s third subroutine is often what new Netrunners might really want to try to work. Brain damage is so very intriguing, but there has yet to be a way to land enough of it with success to finish off the runner. It makes landing meat or net damage easier, which is probably what the tag is there for as well - a single brain damage and a tag as the runner’s turn ends is a prime position for a Scorched Earth to follow up on, making Ichi a good splash into Weyland. That isn’t quite enough to kill them, but there are a plethora of other cards for damage now, and saving the click to get the tag might be all you need. Ichi’s trash program subroutines are probably the more devastating however. Two programs on one piece of ICE is a hefty cost, and if hit with only a single click left (as most runners tend to run on their third click) it can still cost them something. Assuming of course, a relevant icebreaker isn’t already installed. Ichi continues to be useful for what he does, and is often a good, cheap (ish), program destruction for Haas Bioroid. While he hasn’t made that much of a splash, he still has places to go.